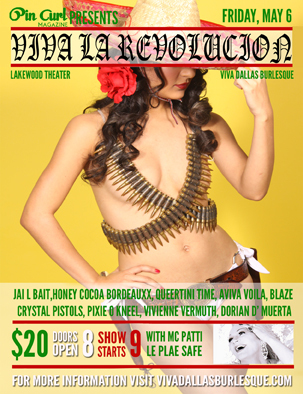 Come To The “Viva La Revolucion” Burlesque Event At The Lakewood Theatre Tonight!!! Come One Come all to tonights fantastic Burlesque event “Viva La Revolucion” presented by Viva Dallas Burlesque. This event is taking place at the historic and cool as hell Lakewood Theatre. Doors open at 8pm with the festivities and one of a kind show starting at 9pm. This show is guaranteed to thrill you, chill you, and fulfill you. We’re heading back to Texas circa 1830 for this one! Banditas, cowgirls, saloon wenches, and outlaws run wild in a time where debauchery was the way of the land. If you’re one of our fans that requested “a chicks with guns” show because “there’s just something so hot about that”- this one’s for you! Viva Dallas Burlesque is a monthly burlesque event (themes and performers change month to month) at the Lakewood theater the first Friday of every month presented by Pin Curl Magazine and the Lakewood Theater. We feature a fun atmosphere with amazing performers in one of the most beautiful theaters in Dallas! Ft. Worth– We haven’t left you out! Tickets are available at the door & we’ll see you at the Aardvark bar on Saturday! Cirque du Burlesque in Dallas Tomorrow Night!!! Naked Girls Reading Presents ‘That’s What She Said’!! This entry was posted on Friday, May 6th, 2011 at 11:05 am	and is filed under Events. You can follow any responses to this entry through the RSS 2.0 feed. You can skip to the end and leave a response. Pinging is currently not allowed. « Roberto Benigni To Act In Woody Allen Film!! !